I’d prance to if I ever won anything. You make me laugh and I’m glad you won. Keep writing Rebecca. Maybe thats whats giving you all this luck, your entertaining website. I couldn’t be more happier for you, Rebecca. When Wolfy announced the winner, I knew it was going to the right person. Way to bring it home! Enjoy your “stuff” and have a wonderful December. Happy hook ups! Congrats! With this type of luck following you around, I recommend getting on a plane to Vegas right NOW! I forgot to ask, what’d you win? Woa! What a grand prize you’ve won there Rebecca! It could Not have gone to a more deserving person to be sure. Especially seeing as you don’t tie up yer own little bits of fluff ‘n stuff. Nice to see that all of your fine work and a little bit of luck, has scored You the big goal little fishin’ sister! Looks reel good on ya too! Oh, good luck on the awesome Bass Pak Wolfy’s givin’ out this round, ’cause I’m in it too this time, cutey! So…this is what the energizer bunny playing a drum and a kazoo looks like, huh? @Larry Thank you! I didn’t enter the Bass fishing contest because I’d rather remain a Miracle than fall back into my normal losing catagory. Wishing you luck though! 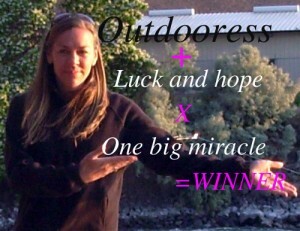 Remember, luck + hope x a miracle= winner! @Indigo So happy to see you visiting this side of my writing life. A bit different than the other place huh….as for the snow. Shhhh! If it snows here in the next few days, I shall totally blame you. @Wolfy the Santa Claus himself! I will most certainly appreciate everything and I thank you so much for running a great contest. Even if I hadn’t won, I thought it was very cool you were doing it. This week, I am SOO excited for the mail! Winning is always good. Good defeats are kinda special too. I got here from the long and winding blog trail from Bayou Woman’s blog. I fish but I’ll be back.